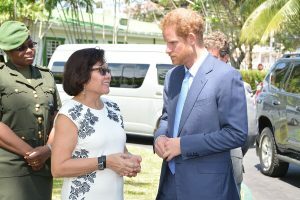 First Lady, Mrs. Sandra Granger on Sundayt hosted Prince Henry of Wales, familiarly known as Prince Harry, at a reception on the Lawns of State House where he had the opportunity to interact with teenage mothers and victims of Trafficking In Persons. The Ministry of the Presidency said the Women’s Empowerment Programme is responsible for the teenage mothers and they were organised by the Women Across Differences (WAD) organisation and the TIP victims were accompanied by representatives of the Guyana Women Miners Organisation. Upon his arrival, the First Lady greeted the Prince and then took him around to meet the young women. As he visited each table, the Prince introduced himself and chatted with the clearly delighted young women. Prince Harry asked if they were willing to share their stories and listened carefully as some boldly relayed their experiences. He seemed visibly touched to hear of their struggles and what they endured and, at intervals, offered them words of encouragement. 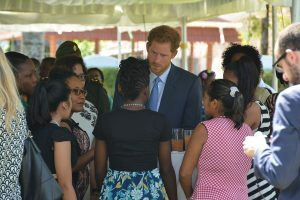 After the reception, Mrs. Granger, in an interview, explained that the idea for the event stemmed from a conversation with British High Commissioner, Mr. Greg Quinn, during the planning phase of the Prince’s visit to Guyana. The First Lady said that the Prince had requested to meet vulnerable groups. “When I suggested meeting with girls, who had been trafficked and teenage mothers, he readily agreed and he was quite enthusiastic about it… We share the same interest in vulnerable members of our population, and I think he just wanted to have [an idea about] what is happening in Guyana… He wanted to genuinely understand the circumstances of the girls,” Mrs. Granger said. Mrs. Granger was happy with the fact that Prince Harry interacted openly with the young women and seemed very interested in their lives. “He expressed his satisfaction. The girls were very frank and forthcoming with him,” Mrs. Granger said. Prince Harry listened to each girl’s hopes for the future and he used the opportunity to encourage them to be there for each other. Additionally Mrs. Granger said that for each girl, an opportunity to meet someone as well known as Prince is a good moment and one they are not likely to forget. “When you think that sometimes these are girls, who are criticised and set aside in society, it’s a big boost for them… they are very happy to be here and I think they feel very good about it,” Mrs. Granger said. Also present at the event were Minister of Social Protection, Ms. Volda Lawrence, Minister within the Ministry of Natural Resources, Ms. Simona Broomes, Minister within the Ministry of Education, Ms. Nicolette Henry, Minister within the Ministry of Public Infrastructure, Ms. Annette Ferguson and Minister within the Ministry of Indigenous Peoples’ Affairs, Ms. Valerie Garrido-Lowe.